Volunteers from PDC Energy chat May 12 at the Colorado Therapy Horses in Greeley as one of the horses munches on hay. The Colorado Therapy Horses, along with PDC Energy and Boy Scouts of America Troop 247, will host monthly barbecues for veterans, first responders and their families. The events will include a church service by Church of the Wind, lunch and a chance to meet the horses. Times: Church service begins at 10:30 a.m., barbecue is 12:30-4 p.m. 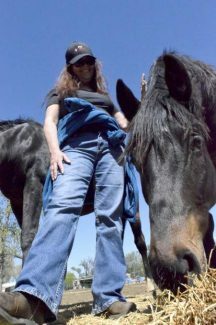 Spending time with the horses at Colorado Therapy Horses is good practice for KC Jones. 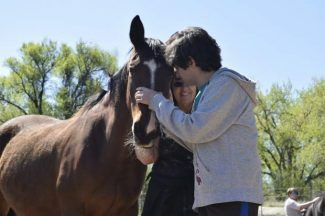 The 19-year-old is graduating high school this year, and he'll walk into the future next to hooves — or paws, or claws. He wants to work on a farm or a ranch, but he hasn't made too many decisions yet. As long as there are animals, he'll be happy. That's a few years off for Jones, though. First, he'll be in Johnstown/Milliken Re-5J School District's special education program for ages 18-21 next year. The program started this year to help students transition into the next phase of their lives after high school graduation. Teacher Kacy Little Owl brought the program's current participants and future students, like Jones, to the Colorado Therapy Horses ranch for a preview of what the program holds. Jones, sporting a wide grin under a wider-brimmed cowboy hat, couldn't have been happier with the sneak peek. "I love being around horses," Jones said, head turning from his peers to the horses in the field every few seconds. He looked over at Little Owl, who said with a laugh that he could go ahead. The Johnstown/Milliken program, recently dubbed JM-Transit, was one of three special needs classrooms invited out to the Colorado Therapy Horses Thursday in Greeley. When they got to the field, which just recently dried up enough for hooves and boots to plod through, a group of volunteers from PDC Energy was waiting alongside the horses. More than 30 PDC employees fed the animals, cleaned stalls and did other ranch duties while the groups of students came and went, all so they could see the magic in person. Because magic is exactly what happens when you put people in a field with horses, said Colorado Therapy Horses founder Richard McMahan. He pointed around the pasture, where special needs students and volunteers alike laughed as dark brown and black Trakehner horses snuggled into people's arms and gnawed on hay. Nearly everyone was smiling. 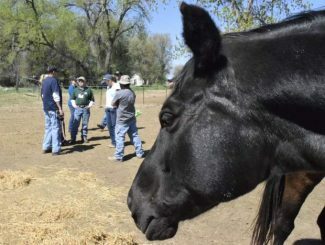 Colorado Therapy Horses was one of many nonprofit organizations PDC Energy chose to support on their annual company-wide volunteering day called "Energizing Our Community." McMahan said. 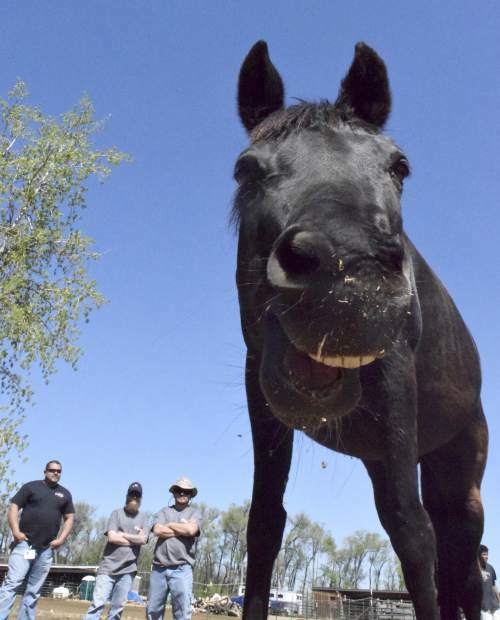 Other employees went to places like the Boys and Girls Club, other equine rescues and more. Susan Fakharzadeh, community relations manager for PDC Energy, said it was great to watch not only the JM-Transit students interact with the horses, but also her coworkers. She said on the way to the ranch, she told the volunteers they would get more out of the day than they gave. From what she'd seen so far that day, her promise came true. "I think it's great to watch people just get out of their daily lives," she said. 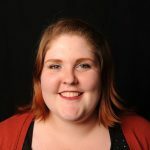 Some of the employees, like level one production technicians Jessi Stumpf and Rachelle Peppler, said being with the horses took away their own stresses. The giant animals were soothing, sweet and more concerned about eating their hay than anything else. Being around them took away the day-to-day pressure to impress, Stumpf said. 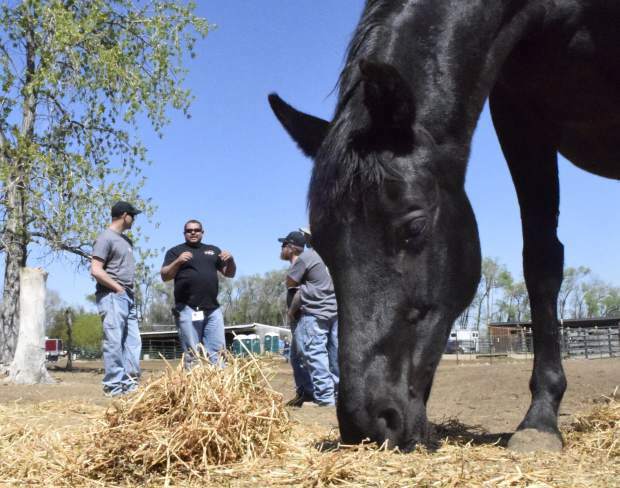 PDC Energy also is sponsoring Colorado Therapy Horses' summer barbecue series for veterans, first responders and their families, Fakharzadeh said. The partnership with an oil and gas company came naturally for the equine therapy company, McMahan said. His grandfather drilled one of the first wells in Weld County and he owns oil royalties on several wells. He hopes by partnering with energy companies, he can show people that nature and development can live side by side.